In 3-quart saucepan, heat oil over medium-high heat. Add carrot and celery mix; cook 8 minutes, stirring frequently, until tender. In small bowl, place 3 tablespoons of the broth; set aside. Stir remaining broth, the water and chicken into vegetables. Heat to boiling; add noodles. Boil 7 minutes or until noodles are tender. Meanwhile, stir flour into reserved broth with whisk until smooth. Stir into soup. Cook 3 minutes, stirring constantly, until soup is slightly thickened. Stir in pepper. Garnish with parsley. Make this soup through step 2—except wait to add the noodles until ready to serve. One of the most important components in a perfect chicken noodle soup is the mirepoix. Also called the “holy trinity,” mirepoix is a mixture of chopped onions, carrots and celery used to add flavor to stocks, broths and soups. This easy chicken noodle soup recipe calls for a frozen bag of these veggies, but you can also use fresh produce if you have more time. The general rule is to add a 2:1:1 ratio of onions, carrots and celery. Other cuisines use a version of mirepoix in their soups as well. It’s the base of some soups in the south; Louisiana gumbos also call for onions and celery, but swap out carrots and use green bell pepper instead. In Italian cuisine, soffrito starts with onion, carrots and celery, but also sometimes features chopped parsley, garlic or even cured meats. 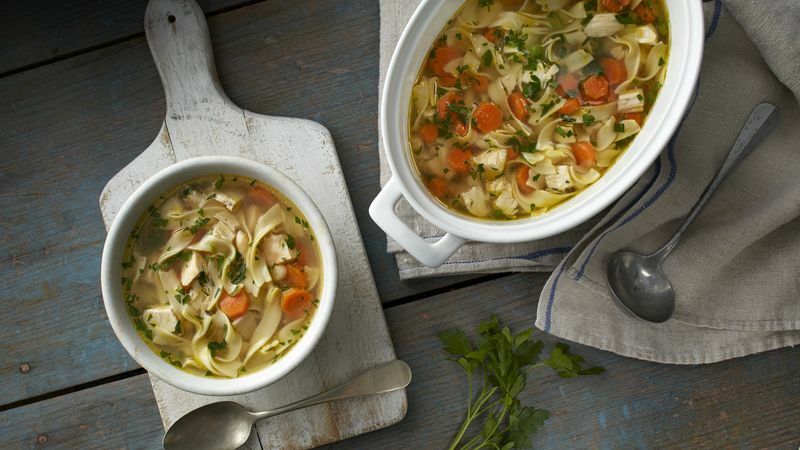 Now that you know what makes a good base for a delicious soup, try more chicken soups next. Then, make them taste even better with our foolproof tips and tricks.